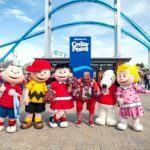 Cedar Point®, a 364-acre amusement park beautifully located lakefront on a Lake Erie peninsula in Ohio, celebrates worldwide fame for being the most visited seasonal amusement park in the United States! Renowned for its roller coasters and thrill rides, the park has a lot to offer including live shows, gift shops, restaurants, a beach, boardwalk, calm and gentle rides, and much more. Cedar Point® has been voted “Best Amusement Park in the World” 15 years in a row! This is hands down the best place to have the time of your life! Sorry! Wheelchair spaces are full for this trip. Are you traveling with your own chaperone for additional support? Error: You must select both a first and second choice airport. Would you like to book the Portland airport shuttle? Pickups in Eugene, Albany, and Salem. $50 each way. If you would like us to send you a bill for the deposit amount, select this option.